On arrival at Delhi international airport, you will be received by our representative and would be further assisted & transferred to your hotel for overnight stay. After breakfast, tour briefing and later on proceed to full day city tour. Visit Qutab Minar, which is one of the tallest towers of it’s time in India, Humanyun’s Tomb – an UNESCO world heritage site which was built by Begum Hamida for his husband Mughal Emperor Humanyun. It is one of the forerunners of the Taj Mahal. Later also visit India Gate, President’s House, the landmark of India Democracy the Parliament House. Take a tour of Red Fort – an UNESCO world heritage site and a symbol of mighty Mughal Empire, Jama Masjid the biggest mosque of India, Chandni Chowk and Raj Ghat (a Memorial of Father of India Mahatma Gandhi). Evening return to the hotel for overnight stay. After breakfast, drive to Jaipur. On arrival check in at hotel evening free to explore the local market. Overnight stay at hotel. After breakfast, visit Amber Fort at Elephant back. Amber is a fascinating blend of Hindu and Muslim architecture. Built in the 16th century by Raja Mansingh in red sandstone and white marble, the palace complex has some very interesting apartments. After exploring this beautiful palace and getting an insight into its fascinating history, visit an architectural delight Hawa Mahal (the wind palace); experience the astrology at Jantar Mantar (the observatory), the royal City Palace & its museum. Later return to your hotel for the night stay. After breakfast, drive to Agra en route visit Fatehpur Sikri was built by Emperor Akbar in 1569 and abandoned after 15 years due to scarcity of water. See the graceful buildings including Jama Masjid, Tomb of Salim Chishti, Panch Mahal and other palaces. On arrival check in at hotel for the overnight stay. Early morning visit of Taj Mahal the inimitable poem in white marble, is the first expression of love of an Emperor Shahjehan for his queen Mumtaz Mahal & return to the hotel for breakfast, Later on take a sightseeing tour of Agra. visit historical Agra Fort (UNESCO World Heritage Site). From Agra Fort, four of the mighty rulers from Mughal dynasty ruled their enormous empire in Indian Sub-Continental. Sikandra a beautiful mausoleum of Mighty Mughal Emperor Akbar. Also visit Itmad-Ul-Daula – a graveyard built by Nurjahan wife of Jahangir for her father Mirza Giyasiddin Beg or Itmad-Ul-Daula, Afterwards drive to Delhi You will be dropped at the international airport or any place convenient to you in Delhi for your onward journey. After breakfast on time departure for Jhansi by train. On arrival pick up from railway station & drive to Khajuraho enroute visiting Orchha famous for its fort The fort is reached by an arched bridge and the three palaces set in an open courtyard within the fort are the first buildings to explore. The tiered Jahangir Mahal was built in 1606 to commemorate the visit of Emperor Jahangir in 1606. The Raj Mahal, to the right of the courtyard, was built by Madhukar Shah and has bold colorful murals inside. The third palace, is the Rai Praveen Mahal, which is a two storey brick structure set in the gardens of Anand Mahal. Of the many temples within the fort, three are especially worth visiting. The Ram Raja Mandir was originally a palace and became a temple more by accident than design. An image of Ram was installed while the temple, The Chaturbhuj was being built for it. For some reason the image could not be moved from the palace and despite its spires and ornate decoration became a sacred place. Linked to the Ram Raja is theLakshminarayan temple, the interiors of which have some of the best preserved murals and wall paintings in Orchha. later continue drive to Khajuraho & check in at hotel. After breakfast visit the eastern & western group of temple, The Western group is certainly the best known, because it is to this group that the largest and most typical Khajuraho temple belongs, The Kandariya Mahadev. Perfectly symmetrical, it soars 31 km high. The very stone seems to have taken on the living, breathing quality of the carved figures.Also in the western group is the Chaunsat Yogini, the only granite temple in the Khajuraho group. Dedicated to Kali. later drive to Satna Railway station to board the train for Varanasi. On arrival at Varanasi railway station transfer to your hotel. Varanasi is the oldest living city of India & one of the worlds' most ancient. Afternoon, excursion to Sarnath - the buried Buddhist city where Buddha preached his first sermon. After attaining enlightenment at Bodh Gaya the Buddha went to Sarnath; and it was here that he preached his first discourse in the deer park to set in motion the 'Wheel of the Dharma'. It is one of the most holy sites as in this place the stream of the Buddha's teaching first flowed. Sarnath was a renowned school of learning from 16th century BC to 12th century AD. Visit the ruins, the stupa, the Buddhist temple & the museum (closed on Fridays). At the museum is the Ashok Pillar with its four guardian lions, used as independent Indias' national emblem. 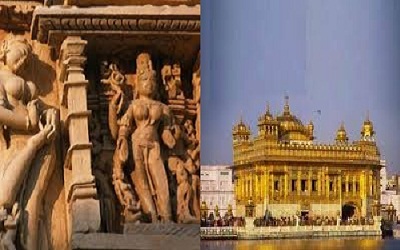 Later in the evening old city tour & Aarti with Boat ride. Overnight at hotel. Early morning boat ride & enjoy the sunrise on the riverfront, as seen from a boat, can be a spiritually uplifting sight. The life on the Ghats bound in an endless string of rituals, ever-changing aspects of the river & the wide landscape across have fascinated visitors from all over the world. Return to hotel for breakfast. After breakfast, on time assistance on departure to catch the flight for delhi. On arrival transfer to international airport to catch the flight for home.